What you believe plays a large part in what you receive. 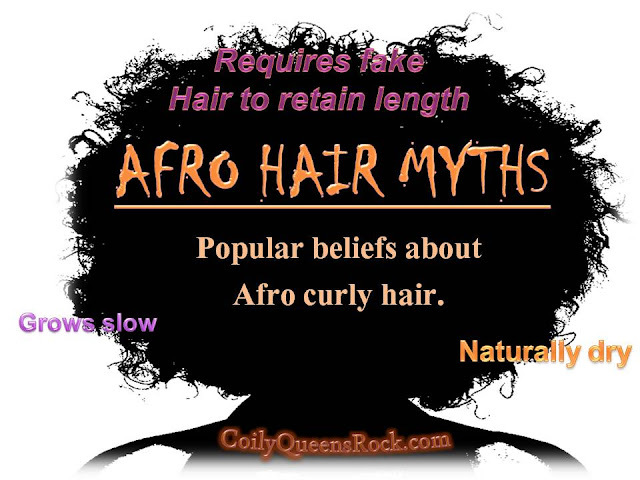 Stop believing common falsehoods concerning black hair. Just because a thing has not happened to you, does not mean it cannot happen. Here are 5 common beliefs concerning Afro hair. Change your mindset, change your journey. Afro hair is curly hair. Curly hair is not weak by default. Afro hair is made up of lots of layers of strong keratin. Hair becomes weak when the protein bonds are damaged. This damage comes from bad care or poor health. Fake hair does not make anyone's hair grow faster. Fact is, if your hair root is still open your hair grows daily. Growth comes from under the scalp. Fake hair cannot control what occurs under the scalp. Afro hair is not naturally dry just because it is curly. If your hair is consistently dry, you need better products and a better regimen. Low sebum production will also make your hair dry. NOT TRUE! You can grow and retain length without relying on fake hair. A protective style does not have to involve fake hair. Keeping your ends tucked is very effective in preventing breakage. Finger combing is also an excellent way of retaining length. You do not have to wear fake hair in order to retain length. Extensions are an option for length retention but not the only way to retain lots of length. When you do choose the hair extensions route, be sure you are doing it the right way. Most people do not grow as much hair as they could with extensions because they are not protecting their real hair. Learn more about the Braid, Retain and Grow method here. Lots of black women think that Afro hair grows much slower than white people's hair. This is not true. How fast your hair grows depends a little on genetics, your health and what you eat. If your hair grows slow, there are things you can do to increase your hair growth rate. I have conceed that you have a European hair complex/desire. I want my hair to grow but not look like European hair, do you have these imagesto post?